Another installment in what fits what, engines/transmissions this time. All will have this pad cast into the case above the clutch cover. The first three characters will identify the model it came in, in this case a XJ. For a full listing of serial/model numbers, look here; http://www.xs11.com/faqs/153-serial-...ry-colors.html. Again, note that regardless of model, the three 'basic' types are the same within those year ranges. So a 2H7 is the same as a 3H3, a 3H5 is the same as a 4R0 except for differences in color, ignition system, and on some, the engine covers. The color differences you'll run into (no help if the motor has been painted) is all the '78-80 motors were silver except for the Midnight specials which were black, and the '81-84 motor which had black cylinders and a silver head (again, except for the MNS). Other than color (and on the '81 models, the ignition/alternator covers), the '78-81 motors look identical externally. Don't depend on the covers to ID one, those may not be original. The XJ motor has markedly different ignition/alternator covers (due to totally different systems) and 'YICS' cast into the cam cover. You can easily see the larger fin on the lower part of the cylinder. A rear view of the XJ. 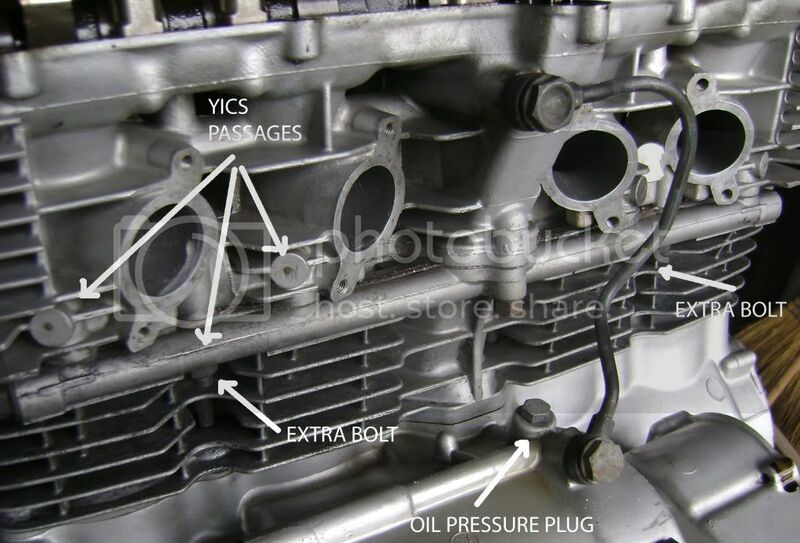 Here you can see the 'YICS' passages cast into the head/cylinder. Most owners block these off (something you have to do to sync the carbs), there's several methods for doing so. Also note the oil plug; the XJ doesn't have a pressure indicator, but rather a level switch in the oil pan (no pic, but it will be obvious). The XS motors will have a pressure switch here, usually under a thick rubber cover. The 3H5 identifies this as a '80-84 camshaft, so it's very likely a later motor. The early cams will say 2H7 instead. 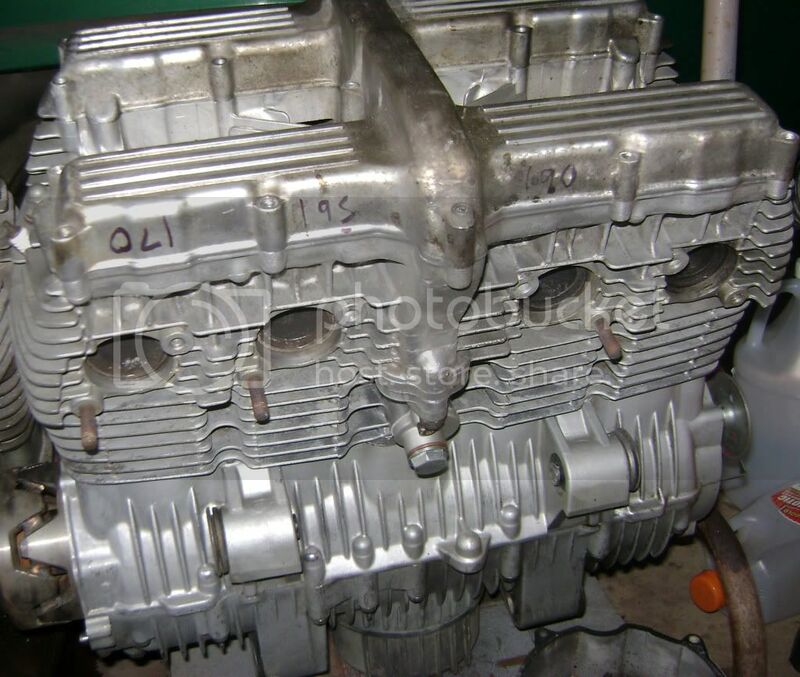 The other major differences is the heads/valves/pistons. You'll have to pull the head to see these. You really want to keep these together and not swap parts around. 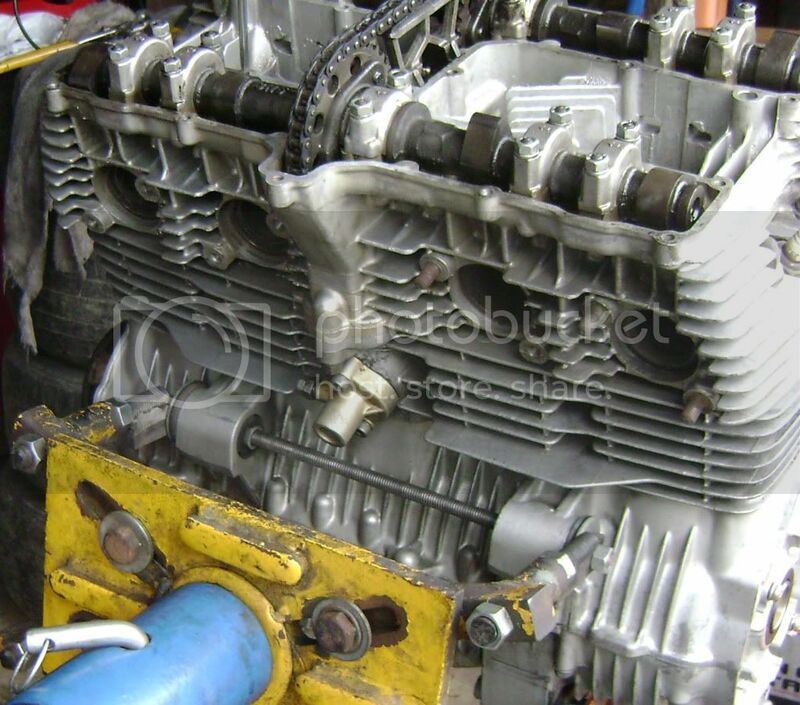 Because of the different combustion chamber size, piston crown and valve sizes, swapping parts can cause issues. Putting the later head on with early pistons will lower the compression ratio by at least a half point (for a power loss) plus having to check for piston-to-valve clearance. 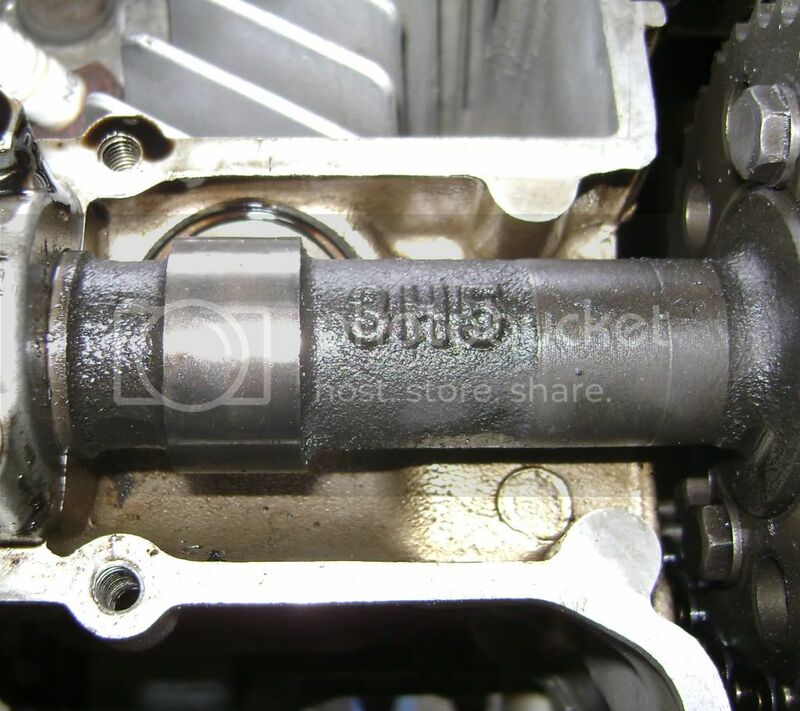 Going the other way will raise compression, but again you need to check piston/valve clearance. You cannot swap valves between heads as the stems are different lengths. I'll mention ignition systems here; generally, you want to run the '78-79 ignition with the '78-79 motors. Same goes for the later motors, use one from the same 'type'. 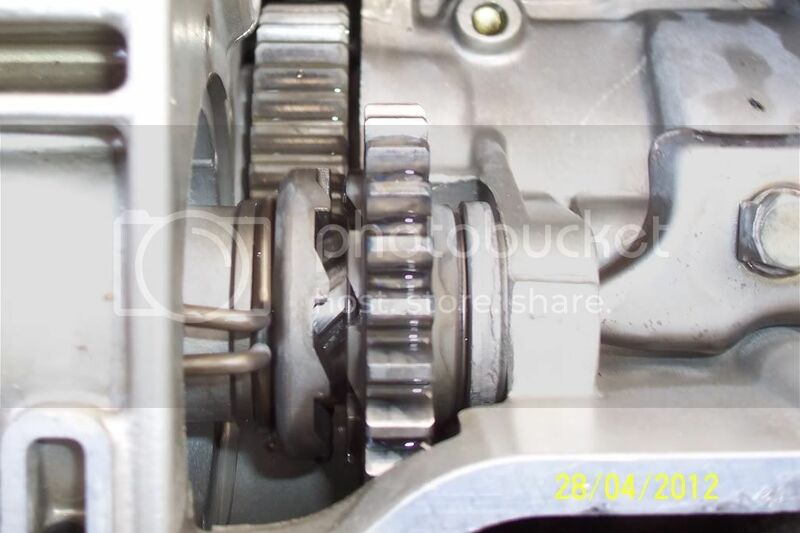 Because of the camshaft differences, you may have tuning issues if you 'mix' them, and may suffer a loss of power. This isn't a hard-and-fast rule, but simply a recommendation. 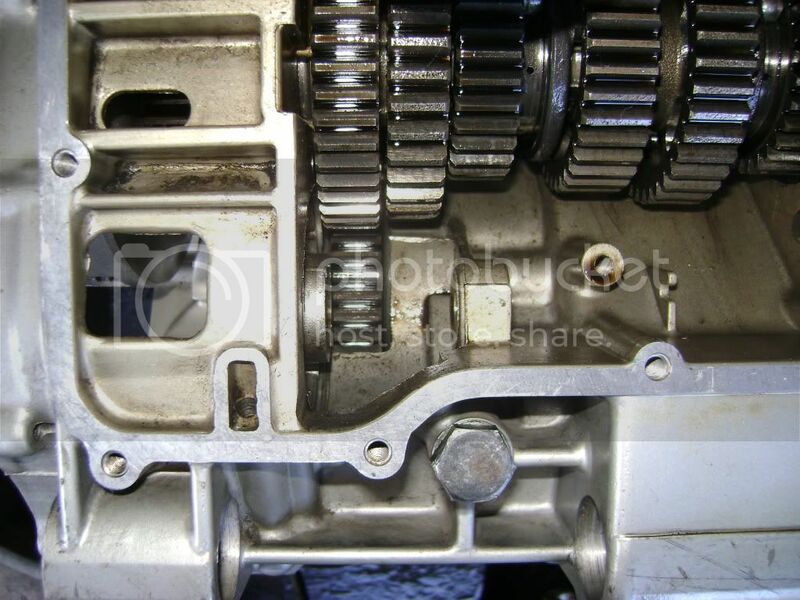 Except for the top-end differences noted, all other internal parts are the same; crankshaft, rods, transmission, clutch, etc are all identical. The middle-drive gearboxes are the same also. The last remaining difference not noted so far is the kickstart mechanism, and which motors had it. All the '78-79 motors came equipped with a 'emergency' kickstart. Yamaha deleted the kickstart starting in '80, but didn't quit installing the internal parts right away. 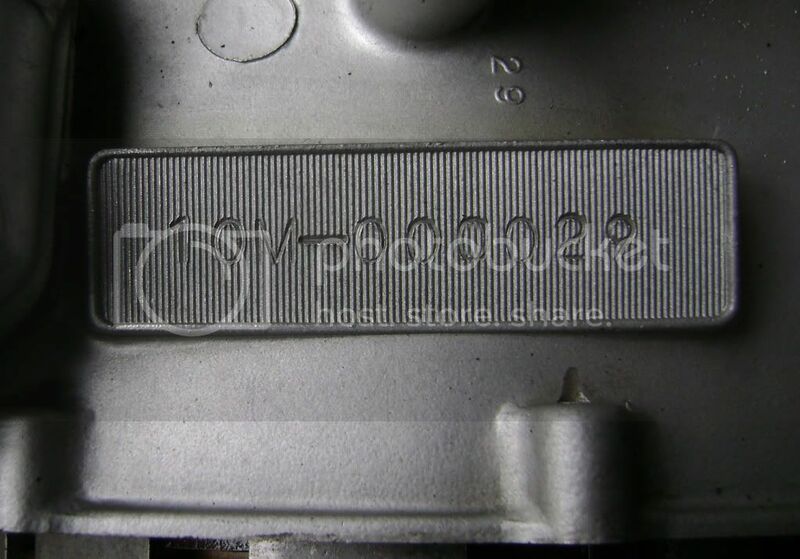 If you find a shaft sticking out of the clutch cover in the hole marked 'kickstarter', you have it. If that hole is plugged, then you're missing at least some of the parts, maybe all of them. 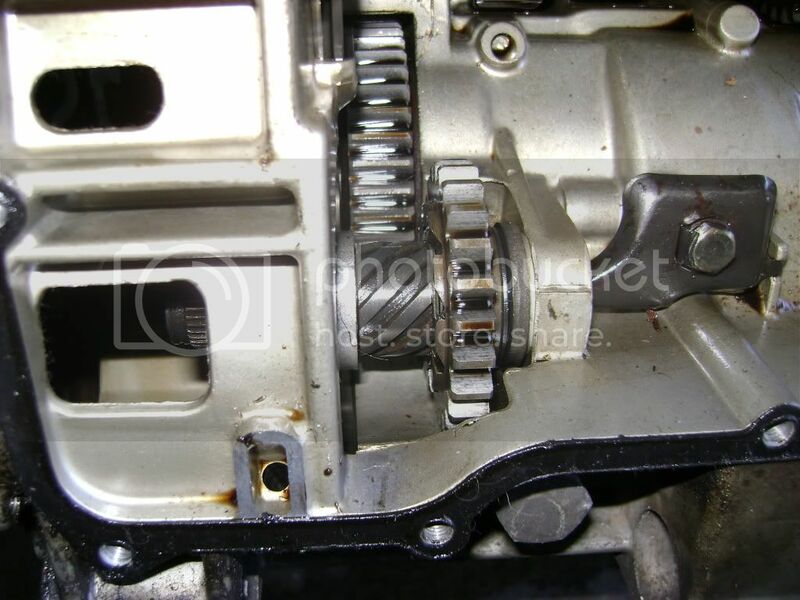 Besides the parts inside the clutch cover, there's internal gears in by the transmission. With the oil pan off, this is what you'll see depending on which year you have and when it was built. If you have a '78-79 motor with the kickstarter (and possibly some '80 without it) you should have this inside the gearbox. You can see the ratchet assembly clearly. Later 80s and '81s only had part of it. The shaft and internal gear is there, but the ratchet is missing. By '82 none of it is there. Supposedly some '81's were like this also. You'll need the entire assembly to 'convert'. One last comment on the kickstarter. This was never intended to be used for anything more than 'emergency' use (I guess Yamaha didn't trust the reliability of their starter at first) and as such wasn't designed for regular use, which is why the kick lever wasn't permanently fitted but instead 'stored' in the frame. Some have found a kick lever off a 850 can be modified to fit as a permanent install, but the kicker shaft runs in bare aluminum, not the steel bushing Yamaha fitted on virtually every other bike they sold with a kickstarter. You may experience cover wear/leaks with constant use. 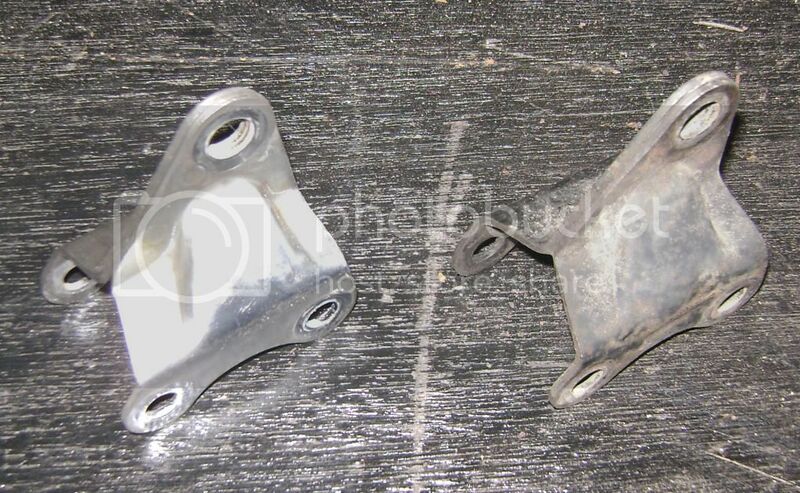 Front upper motor mounts are identical across all XS/XJ models. The only difference is the standard versions are painted, the Special/XJ ones are chromed. 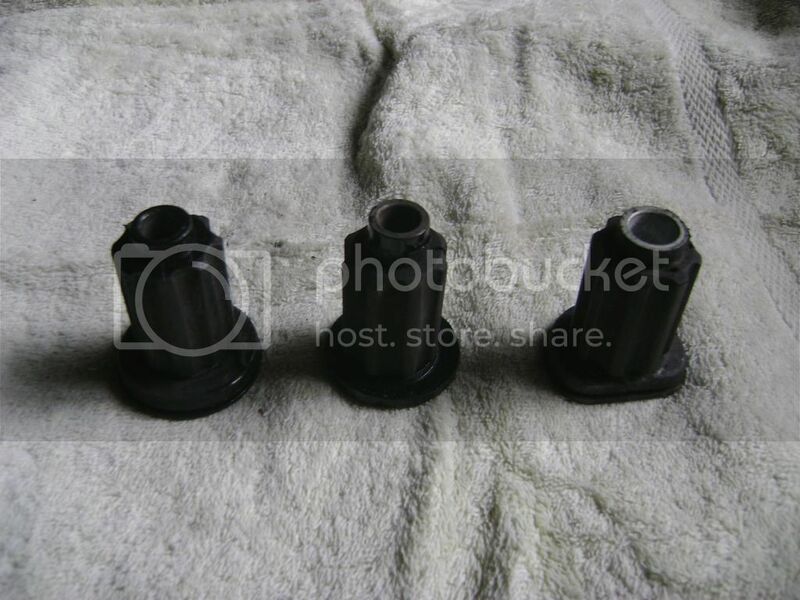 There are three different rubber insulators though... Left to right, front upper, front lower, and rear. The front two are similar, the upper has a metal washer the lower one lacks and they don't interchange. Both have 10mm bolt holes. The rear bolt hole is 12mm. Last edited by crazy steve; 05-02-2013 at 07:07 PM.